Managing ticket sales manually takes time. 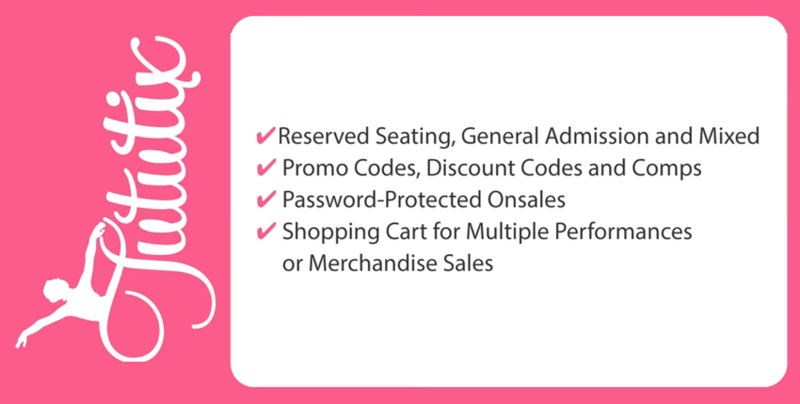 Simplify and streamline your recital ticketing process with Tututix Online Dance Recital Ticketing! Quick and easy set up, free to studio owners. Tickets can be purchased from your dedicated event page at www.tututix.com, from your Facebook page, or via a toll-free call center. A small fee is passed on to your patrons to cover the cost of the service. Tickets can be sent electronically via email or smartphone. Full color, foil-embossed, barcoded keepsake tickets can be mailed directly to patrons. Ticket sales proceeds are direct deposited weekly.